Chantel Hobbs has an incredible story to tell. She was a busy mother, struggling with obesity, and looking for a way to change. Her journey to fitness (notice that I didn’t say just weight loss!) began when she embraced the idea of living one day at a time, the best way she could. By making healthy choices, changing the way she thought about food and exercise, and forgetting past failures, she was able to lose nearly two hundred pounds. She’s kept the weight off for nine years now, has a new career as a personal trainer, and regularly runs marathons. 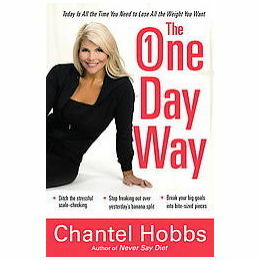 The One Day Way touches on Chantel’s story and the insights she’s gained along the way. The main purpose of the book, though, is to show readers how they, too, can achieve a greater level of fitness by taking it one day at a time. Have a bad day where you don’t work out and splurge on a whole box of Twinkies? (Okay, so maybe that’s extreme. But you get the point!) Tomorrow is a day to start over, without looking back. There’s no need to let one bad day set your whole course off track. Your goal shouldn’t be four months from now — it should be one day from now. Chantel writes in terms of “bite-sized goals,” achieving successes little by little until larger goals are met. I appreciated the book’s focus not just on weight loss but on lifestyle changes. What good does it do to lose pounds when you haven’t changed anything about your life apart from your dress size? Chantel insists that we have to change our thinking first — primarily about food and the way we look at it. She writes, “What if we eat to live most of the time and then plan to live to eat occasionally?” Her point is that, yes, we should enjoy our food, but if we live life looking to food for our constant enjoyment rather than looking at it for what God intended it to be (nourishment, or fuel as she calls it), then we have an unhealthy problem on our hands. Correcting the way we look at food by changing the way we think is the only way to begin the process of living a healthier lifestyle. I took a lot of good information away from this book. While I don’t struggle with weight issues, I do find myself having the wrong attitudes towards food and exercise sometimes. This book put it all into a helpful context for me. I was a little confused, though, when she recommended that you shouldn’t keep any kind of record about your successes along the way. She even says that if you keep track of your fitness level in a journal (detailing what you did for exercise one day), you should rip it out that page the next day because today is a new day and you shouldn’t look to the past. What if today is building on yesterday’s success? Wouldn’t it be helpful to have a record of those things? Wouldn’t it be great motivation to keep on going? I also had some small problems with some of her theology. Chantel writes from a faith point of view, and at one point, she writes that “because we are His creation, we deserve His blessings.” I think a correct Biblical view never assumes that we deserve anything apart from condemnation. Even the gift of grace purchased by Christ is not something we deserve, and statements like the one quoted above can lead to a more man-centered theology about everything, which is dangerous. Apart from that statement, though, I agree that better health is something that does honor God and that as stewards of the bodies He’s given to us, we should strive for greater levels of fitness. Not because we deserve the blessings that come with it, but because being fit and healthy allows us to bring greater glory to Him.